No Caterham SuperSprints are coming to America, sadly. This year's Goodwood Revival not only saw the rebirth of TVR with the unveiling of the new 500-horsepower Griffith sports car, but also a new retro racing-inspired Caterham Seven. Called the SuperSprint, the track toy is essentially a love letter to the original Lotus Seven to celebrate its 60th anniversary, with unique liveries inspired by the 1960s racer. 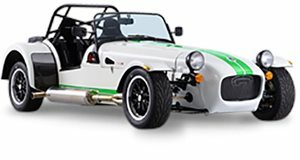 Only 60 examples of the Caterham Seven SuperSprint are being made – and they all sold out within just seven hours of the car being revealed. To put things in perspective, Caterham sold over 600 Sevens last year, meaning that the SuperSprint is likely to make up around 10 percent of the company's overall 2017 sales. “There is quite clearly an appetite for retro styled cars and we’ve tapped into that trend with the Sprint and SuperSprint”, Ridley added. Among the SuperSprint’s retro-inspired styling features include a unique Brooklands windshield, quilted seats, and a wood-rimmed steering wheel. Six vintage paint schemes are available named after famous race tracks, while a three-cylinder engine sends 95 hp to the rear wheels, resulting in a 0-62 mph sprint time of 6.9 seconds.